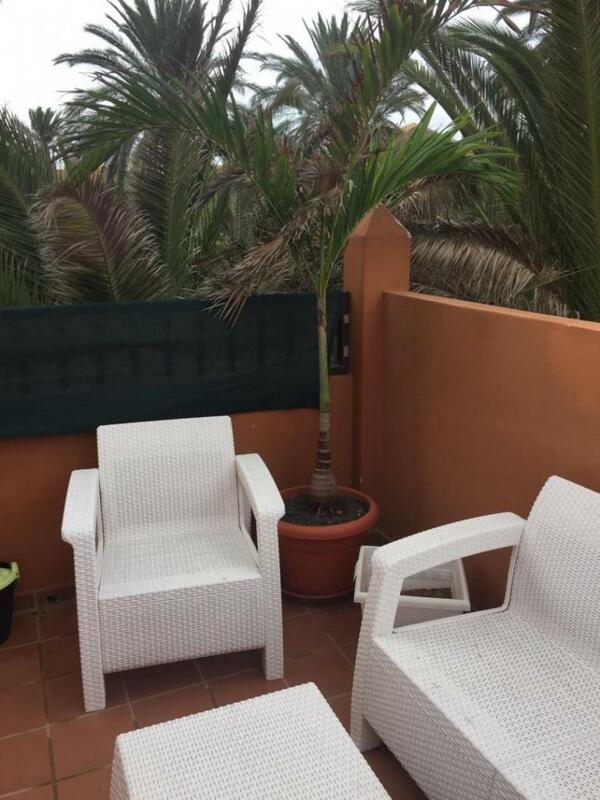 Can King palms, Archontophoenix, be ok for outside on terrace in pots? My 7g Adonidia is doing well in pots, but would king palm be ok, or only in ground? And what feather palms, are good for outside pots? Coconut? Queen? DypsisPembana? I know some palms , dont like being in pots? 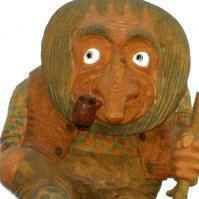 So i,m told? Spindle and bottle palms both do well in pots. King palms grow really quickly and soon fill the pot they are in. After that they will struggle unless you have a really big pot. Would Dypsis Pembana be ok in pot ? My new addition, a small Dypsis Pembana..Is this palm too small for outside terrace ?? King palms can be kept in pots for quite a while, but they do get really, really large fast. I've seen them 8 to 10' tall in 25 gallon pots, so it isn't unreasonable to put them in a pot on your patio if you want to. 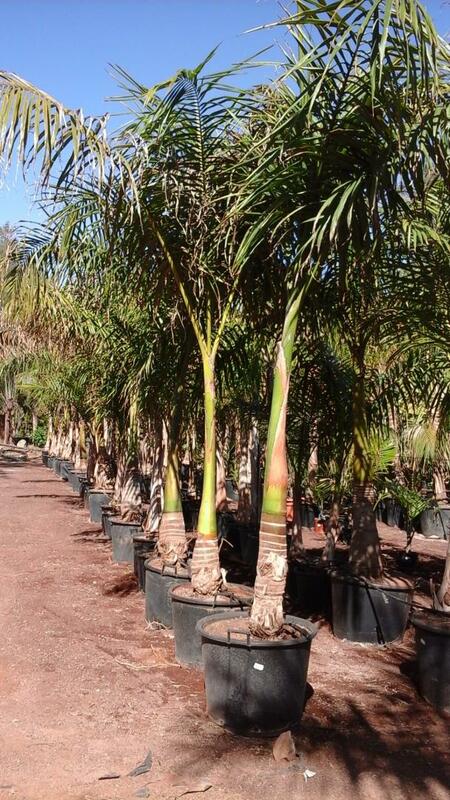 Dypsis Pembana is ok in pots too, and may be fine in a 3 gallon to 7 gallon size for quite a while. The D. Pembana will want part shade when it's young, especially if you have a lot of sun on your patio. 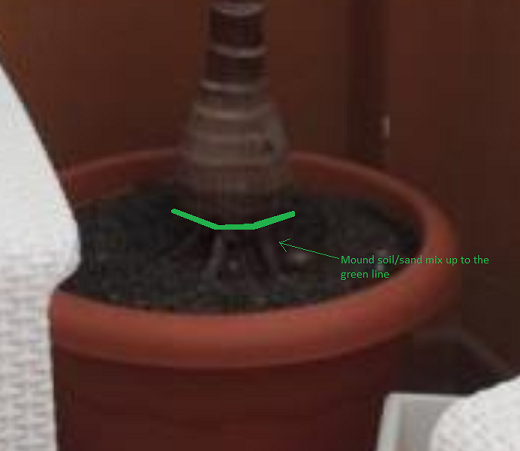 I have one about twice as tall as the one in your photo, and it's ok for my back patio in FL with about 30-50% shade from tall potted palms nearby. They can take a lot of sun when they are older, but be careful with leaf burn when they are still small, and move them out into sun over a period of a couple of months. Coconuts and Queens are similar to Kings, they can be in a fairly big pot for quite a while. I bought some 15 gallon queens this last summer that were 12-15 feet overall height. I'd echo Neil's comment, Bottle and Spindle (Hyophorbe Lagenicaulis and Verschaffeltii) do amazingly well in pots in full sun. I have 4 young bottles in ~10 gallon pots that should be able to live there for 5-10 years. Adonidia are really nice in pots too, though yours looks like it is planted about 1-2 inches too high. It should have soil just up to the bottom where the roots come out sideways. It'll grow like it is, but won't grow as fast or be as healthy. Generally you want the roots to be slightly covered, but don't cover the root base or you could get rot. I sketched this on your picture really badly. If by "Areca palm" you mean Dypsis Lutescens, they will grow in sun or part shade but generally are best with a bit of shade, especially if it's not too humid where you are. 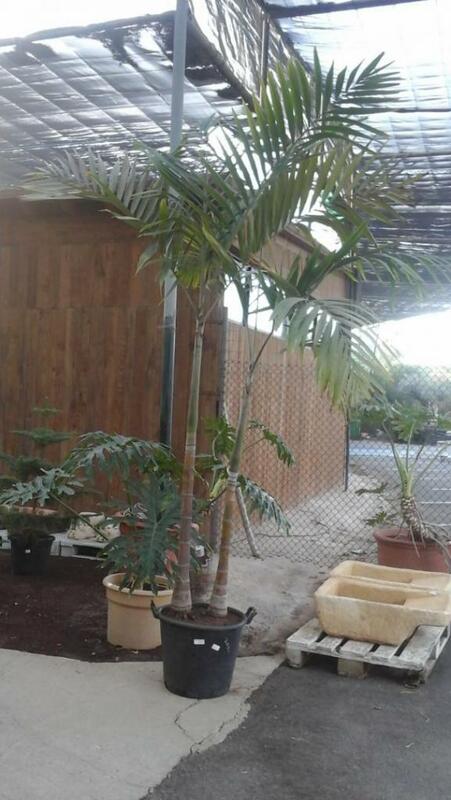 Here's a useful thread about "mounding" for palms, and has a good link to a long article about planting depth and soil mounding for optimum growth. I bought a couple of Bottle palms that were about 3-4 inches too high, and they were in bad, bad shape. They dramatically improved in about a month after being repotted at the right depth, and are pumping out new fronds here even in the middle of winter. So top up the soil until its reaches hieght where your green line is ?? I will buy another double xmas palm, does this one look ok ? Also, is this a King palm ? Above looks more like a Royal Palm. But hope the Double Adonidias look ok ? It's generally safe to put well-draining soil mix up to the base of the trunk. As long as you don't go above where the side roots emerge it should grow better. Just don't use a heavy compost or dense potting soil. It'll turn to goop and can contribute to rot or fungus in the roots. I'm not an expert on palm ID, but there are several Archontophoenix varieties that all look somewhat different from each other. The most common around FL are Alexandrae and Cunninghamiana. The Roystonea Regia looks similar but has more "plumose" or "droopy" leaflets. The only royals I've seen are huge so I'm not sure which one that is. The Adonidia double looks ok, but the smaller one has an odd kink in the trunk. If you want a "perfect" sample for a small patio I'd pick a different one. There's probably nothing wrong with it, and no palm is "perfect" anyway. Should the Adonidia Double be planted in bigger pot or container ?